We had some spring weather a few weeks ago so I began thinking about my spring bedding. Shabby Chic images on Pinterest inspired me to look for some muted shabby roses to add to our all white bedding. I wanted pillow cases and a coverlet. Walmart or Target didn't really have what I was looking for. Rachel Ashwell's line from Target looked a little too juvenile. I'm excited that we have a Tuesday Morning right down the street from work. They had several sheet sets that would work. I chose one in a pale green with pale pink flowers. The pillow cases have been on for a few weeks. The quilt was on hold while I fought off a sinus infection and then a stomach bug. A quick trip to Walmart yielded the rest of the supplies. 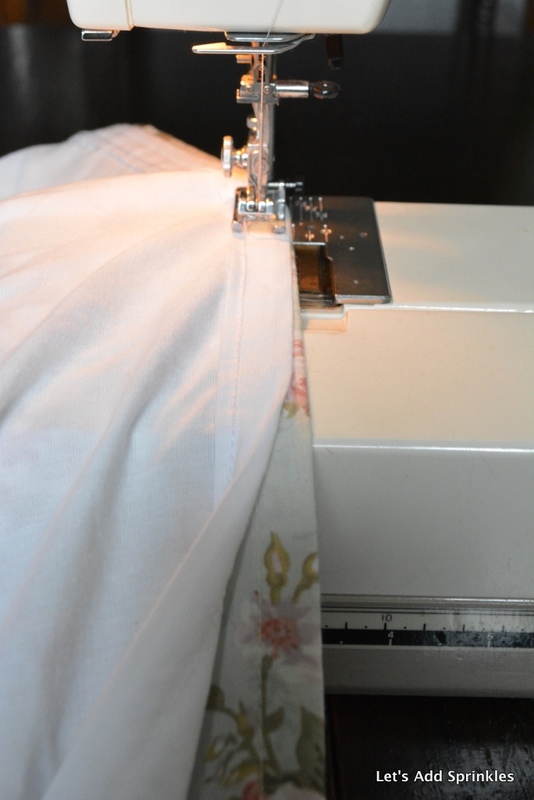 With right sides together, sew the sheets around three of the four sides. 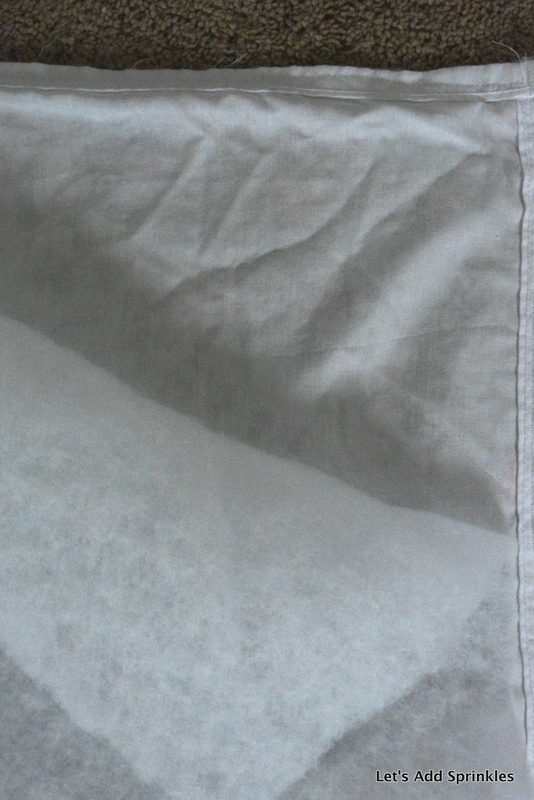 That means the printed side of the fabric is toward the finished side of your other sheet. 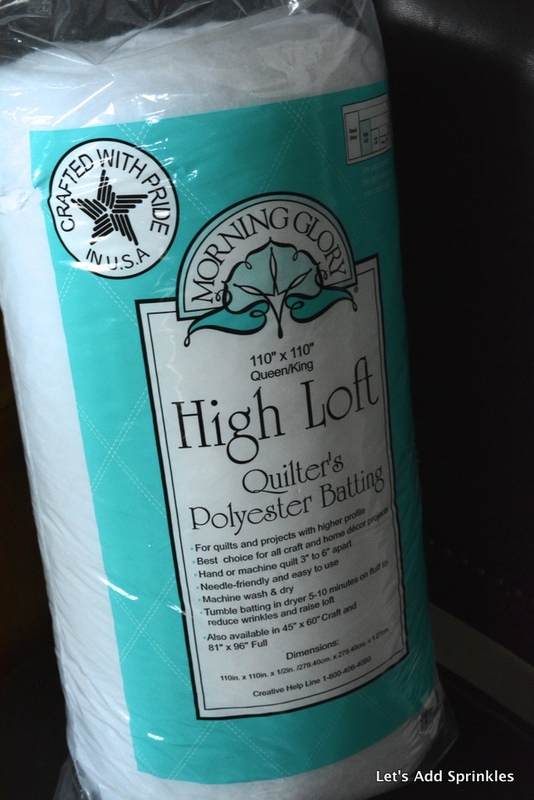 Lay the batting on top of your two layers of fabric. Smooth out your layers and trim any excess. 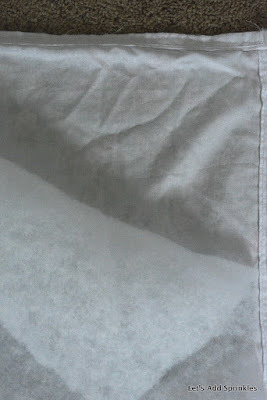 Turn the fabric layers inside out so that the batting is sandwiched between the top layer and bottom layer of fabric. Straighten and reposition your batting if need be. Sometimes it gets a little crooked and out of position during the flip. Once you have done this, it's time to finish your quilt. The cat will fight you on this. You could hand stitch, machine stitch or hand tie your new coverlet. I will close up the last side after it has been quilted. That way I can reposition batting if needed during the quilting. Look for the reveal soon. This has been fun and I think it will add just the right pop of spring color to the end of our bed. I haven't done any other new blog projects since I was sick for so much of February. Contrary to some of the comments on my last post I wasn't painting during my stomach bug or during my sinus infection. Those projects were done in January. I just finished up taking pictures, editing them and writing the post. I didn't want my boss to think I was staying home from work and painting. We do have some stuff in the works for you. We are looking into countertops. The mancave needs popcorn removal and a coat of paint on the ceiling and walls. The laundry room needs painting. I'm thinking about repainting the dining room in a lighter gray. We are looking at two new rugs for the entry way. 8 years of dogs sleeping on our old ones is long enough, I think. Spring Break is coming up in a little over a week. I'm mulling over which projects to get done. Your bed is so pretty! I love the shabby chic look and have it in two bedrooms. Target used to have a much more extensive line but I think it's mostly discontinued. You did a great job sewing - wish I had that skill. Thank you, I made one year's ago and I needed to be reminded as how to do it again! I love the whites and I adore the pink Roses. Does give me hope for spring time! can't wait to see this. I know it will be gorgeous for Spring! Can't wait to see it finished. I think I could make this. Katie, I love the pretty roses. Can't wait to see the coverlet! It is the perfect touch for Spring. Who doesn't love roses? Glad you are feeling better. Sounds like you had a rough Feb. So sorry! Thanks for sharing with SYC. I love the pattern of the sheets you're using for your bedding! I wish there was a TM near me. I'm looking for floral sheets to make curtains, but I haven't found any I like yet. Are you doing the quilting yourself?